1. In a bowl, mix together the miso, smoked paprika, chilli flakes, soy sauce, garlic and honey. Put the paste into a large lidded pot, then add the potato, onion, carrots and most of the fresh chilli; cover with 500ml water. Bring to a boil, then reduce the heat and simmer, covered, for 15-20 minutes. 2. Add the monkfish and simmer for another 8 minutes, until the vegetables and fi sh are cooked through. Stir in the sesame oil. 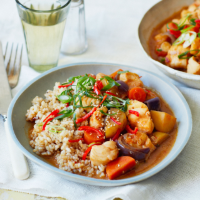 Serve the fish stew in bowls with brown rice, if liked, and the salad onion, sesame seeds and remaining chilli scattered over. This recipe was first published in Sat Apr 01 15:25:05 BST 2017.